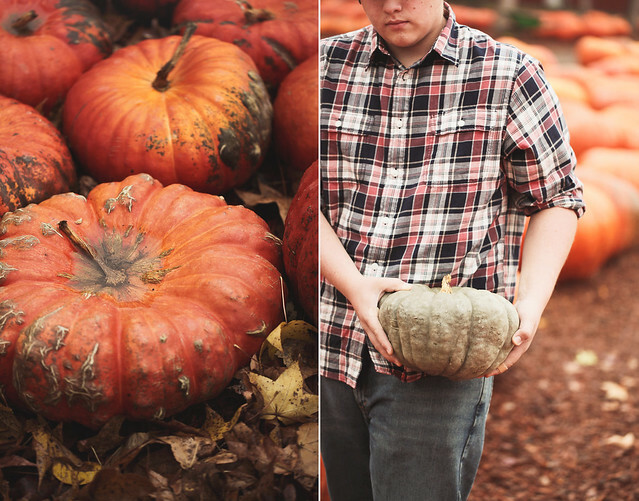 Back in October, I took a trip to a pumpkin patch. It was such a beautiful day, the leaves were still gorgeously vibrant, some of them even still green. I wanted to tell you all about it right away, and I wanted to bake something delicious with all the pumpkins I had picked out. The green ones, the orange ones, the white ones. I had recipe ideas, namely a hazelnut-pumpkin-ginger tart that I could practically taste in my mind. But then life got busy. One week turned into 2 and then somehow it was over a month after the fact, and not only had I not made anything with those pumpkins, I felt like I had forgotten how to blog. I wondered if I even wanted to anymore. My 3 year blog anniversary passed (happy belated birthday, h&j!) and I did nothing to commemorate it. I was feeling a bit disconnected from this process - even though I love it dearly. Today though, I received an email from a friend, a friend I met through this blog. Reading her words, I was reminded why I love doing this. I love sharing my recipes & images, I love connecting with you all, (nothing makes me smile like getting an email from someone who has made a recipe & loved it) I love the creative process. I was reminded that this place is a piece of me. A piece I’m not ready to part with. 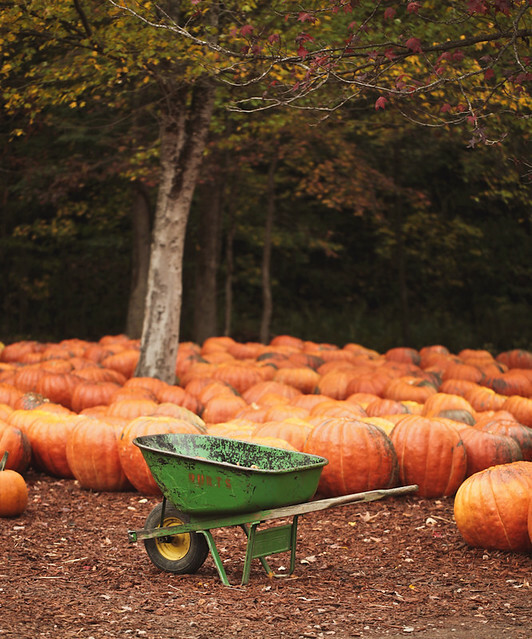 The leaves are gone, the pumpkins are in the compost bin, and I’m ready for a new season. I’ll be here soon with recipes. Good, creative ones, I hope. I’ve been creating more and more of my own, and I’m excited to share them with you. Happy anniversary Hannah. Beautiful post and photos. Here's to another great year! The photos are beautiful. That place is gorgeous. happy anniversary! good to see you back! 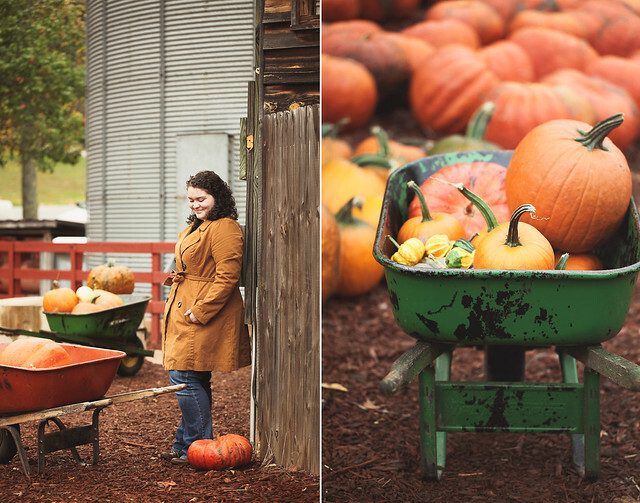 Thanks for sharing your pumpkin patch trip...looks like it stirred up your creative spirit! I COMPLETELY relate to your feelings. I think being able to take a breather every once in awhile is necessary to keep your sanity! These images are gorgeous: so warm and inviting. I can't wait to see what this new season brings for you! It's always a joy reading your words and looking at your pictures. They are filled with such emotion... such passion. And I'll always come back for more. Great post Hannah. I have those "do I even want to do this" thoughts occasionally, but like you...I find myself drawn back. I'm grateful you're back and am looking forward to your future creations. Happy Holidays. These photos are gorgeous! Such pretty autumn colors. Hi Hannah, it's so great to hear from you. I'm sure all of us can relate to your feelings at one time or another. Take care! Don't ever stop blogging! I LOVE H&J! Lovely post, Hannah! I check my Blogger dashboard quite frequently to see if you've posted or not. Love your posts, and of course, your recipes! Fabulous news! We have missed you! Hannah, you are such a talented artist. I've been anxiously waiting for this post and I'm so glad you are back. Everybody needs a break sometimes - to sort our thoughts, to live our lives, to express and find ourselves outside of our public (blog) personas. I'm just resurfacing from one of those moments myself. You'll be welcomed back with open arms, no doubt. Looking forward to seeing some of your new recipes! Your blog is so lovely and inspiring - I'm glad to see you want to stay around. Also, I have that same green pumpkin in my kitchen right now. I love it so much I haven't been able to send it to the compost pile. Your photos are stunning! They made me feel great on this dreary snow filled day. Thank you for sharing and I look forward to more posts and can't wait to try the whole grain pumpkin pancakes. We all pass through this kind of phases (why am I blogging? Do I still want to do this?) and it's good to take a break from time to time to figure out, try new things in photography, live... life and get inspired again! That being said, it's REALLY GOOD to have you back Hannah!! Gorgeous clicks! I love those colors (brown & orange). Happy belated Blog Birthday and to many more. We all tend to get tired of our blogs, so it is sometimes good to take some time off in order to come back full of energy. It's great to see you back, Hannah, and I'm glad to hear you're not ready to part with this piece of you! 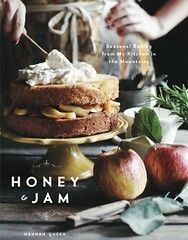 Looking forward to your new recipes, and the pictures - as always - are gorgeous! missed your posts; glad to see you back! Those are some of the most amazing pumpkins I've ever seen. Beautiful images here as usual! keep it coming! Happy Blogaversary! I'm so glad you're not going to stop this. I always look forward to your posts and pictures! ps. love that trench coat, such a nice color! love this so much. your photos are stunning. you capture light like no other. so happy to see that you're back! I'm so glad you are back! I love your blog...it is definitely one of my favorites! Beautiful snaps and welcome back! That rhymes, badly. Either way - fab post! I just found your blog a couple months ago and read through every post. Then I kept seeing the same pumpkin pancakes on the front page and wondered when you were going to post again. Your photos and recipes are amazing! They inspire me. So glad you're sticking around! So glad you decided to stay! I love your photographs... I check your blog everyday! You are so inspiring!! Hi, there. Thank you so much for posting this! You've inspired me to dedicate more time to my own blog, which has likewise been sadly neglected. This is my first visit to Honey & Jam. I'm excited to look back at your old posts, and I can't wait to read more from you! Hannah, I am so happy to have found your blog. Your photography is exquisite. Your cooking & baking is fantastically delicious. I read your about me section & love you even more! It's so nice to meet fellow bloggers who love Jesus! Just wanted to encourage you that your work here is beautiful & so appreciated. Keep the loveliness coming! I'm SO happy you're not leaving your blog, although you would have my deepest understanding if that were so. 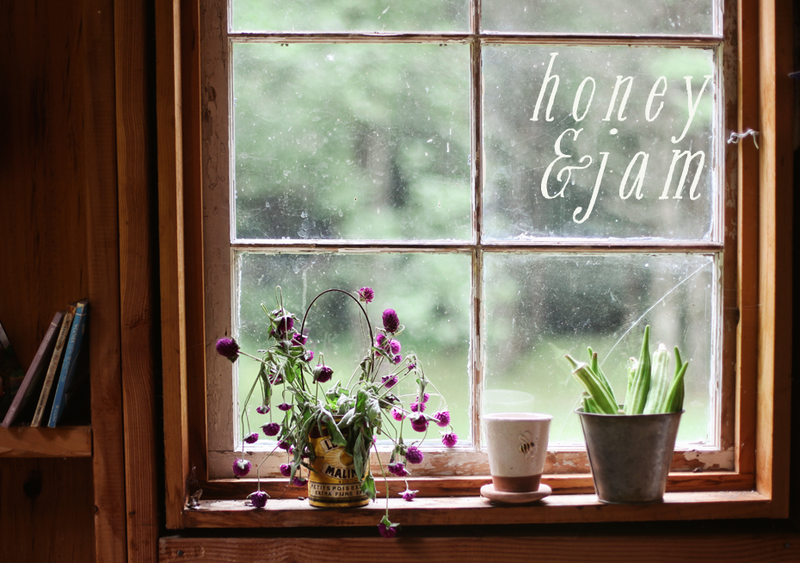 I love and adore honey & jam, and I'm thrilled that we have actually become friends. Love and Hugs sweet Hannah. xo. I'm looking forward to the recipes to come! It's so great that you're rekindling your love for the blog. We'd have missed you. These photos are so great. It's nice to be reminded of fall as the weather get chillier. I love your pictures with pumpkins, specially the first one ! congratulations ! 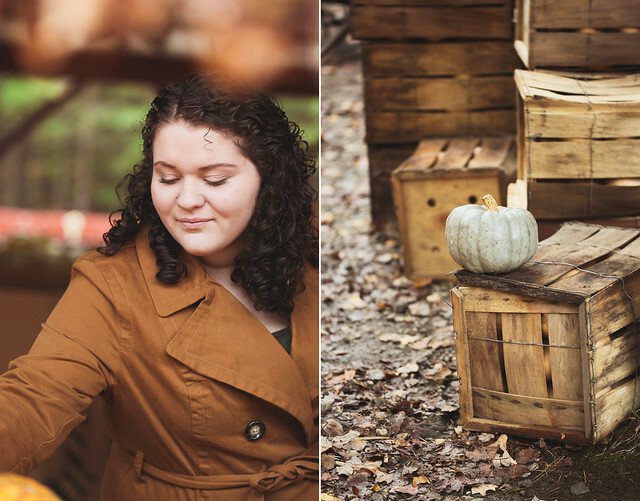 That first pumpkin patch pictures is just GORGEOUS! I think the wavering is totally normal. Our passions ebb and flow and sometimes we just need to let things steep, to step away for a bit. Glad you have felt called to return, you are an artist and I hope you can see/feel how much this community appreciates your creativity and integrity. Hugs to you. So happy that you're back. I'm a new follower, but I already missed you during your short absence. I found you at the Paper Mulberry, & I have also added your blog to my sidebar. I'm eager to see what's in store. I cook a lot and frequently try out new recipes. Have a wonderful Christmastime! Your blog makes me SO happy. The pictures, unique recipes and the way you write. Loveeee it all. I am a fairly new follower. Just found your blog a few months back... and I am hooked! So glad to hear you are continuing the posts. Your pictures are just beautiful & the writing is so eloquent... who would ever guess you are as young as you are. Can't wait for your next post (& recipe)! I am so glad that you are back! Your photos are spectacular! They make my mouth water! And inspire me want to get into the kitchen and make something. I can't wait to see what you "cook" up next! I know that it will be amazing! Looking forward to another year of posts! I think taking a break and a breath are so important in this process, and so often we don't know how important until we're in the middle of it! You can't always predict these things you know! I just discovered your blog, so I'm very, very glad you're back and ready to write about cooking again. Hi Hannah, I don't think I'd ever commented on your blog before, but I'm really glad you decided to come back after your break. I've always found your blogging style to be truly beautiful and appealing, so thank you for keeping this up. Hi HAnnah,i'm so late in finding your blog and you have opened my eyes towards lovely food and amazing photography.thanks for inspiring me . I'll be here waiting...I have loved every single one of your recipes that I have made. I don't know what I would do without them now! first time here, but the last !! I definitely understand about life taking over and getting behind in that which we so enjoy doing...it's the end of December and I'm finally making the time to visit the blogosphere. Even if it's once a month, or once every other month, I sure hope you will be able to keep blogging. Your pictures are such the inspiration! I totally feel you with the blogger's block - I get it, too. I love your site and photos so much. With this increments they are going to make a awesome things at a time.As they are taking this things from here so it is must to be a special something.So i am very excites to see what they are going to make here. I always like to know some important things. So i adhere to this site for collecting some important and useful article for post and sharing with some of my friends. I like this article. its so nice.